As the Nashville Predators chart new hockey territory, the players that helped get them off the ground feel immense pride in what they helped create almost two decades earlier. The inaugural Predators, who debuted in the 1998-99 season, knew there would come a day when their franchise reached the third round, and maybe beyond, of the Stanley Cup Playoffs. Many thought it would come in less than the 18 years it has taken, but the delay is trivial now that the moment has arrived. The Predators are in the 2017 Western Conference Final against the Anaheim Ducks and will play Game 3 at Bridgestone Arena on Tuesday (8 p.m. ET; NBCSN, SN, CBC, TVA Sports). The best-of-7 series is tied 1-1. Through three rounds of the postseason, Nashville has caught Stanley Cup fever. Their Predators — those first-year players still feel a sense of ownership all these years later — are one of the final four teams standing for the first time. Tom Fitzgerald was the first captain, recruited by Predators general manager David Poile to teach the lessons Fitzgerald learned during an expansion run with the Florida Panthers in 1993-94. Today, Fitzgerald is the assistant general manager of the New Jersey Devils but he is still tuned into what the Predators are doing. “Excitement, pride that I was a part of that organization and where it is at right now,” said Fitzgerald when asked his thoughts about the level the Predators have reached. “There is a ‘wow’ factor. “Why they never got past the second round? Well, you know what, there are a lot of good teams in the Western Conference. Mike Dunham, now the goaltending coach with the New York Islanders, was part of the first-season goaltending platoon, sharing time with Tomas Vokoun. 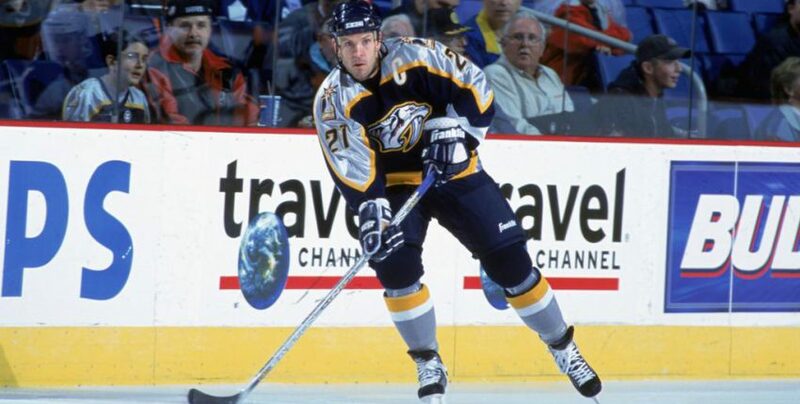 Andrew Brunette, a forward, scored the first goal in Predators history against the Carolina Hurricanes in a 3-2 win, the first for the franchise, on Oct. 13, 1998. It was their second game, after a 1-0 loss to the Panthers three days earlier. Today, Brunette works for the Minnesota Wild as a hockey operations adviser. He also still follows the Predators closely. The former players all keep close tabs on Nashville because their memories of that time, and of the unique challenges they faced, are magical. They were on a journey afforded only a select group of men and were based in a unique market, one with little background in the culture of hockey but one that couldn’t have been more open to the missionaries bringing the sport to their midst. Drake Berehowsky was one of those players. The defenseman was acquired in a trade with the Edmonton Oilers on Oct. 1, 1998. He spent almost three full seasons with the Predators and called it one of the most memorable stops in an NHL career that spanned 13 seasons and six teams. Berehowsky said he remembers it all like it was yesterday, from the cocktail parties at the home of country star Barbara Mandrell and interactions with other country music stars to the outreach into communities that never had experienced hockey. He remembers the warmth with which he and his teammates were welcomed by a populace that may not have known much about hockey but had an overwhelming enthusiasm for learning the game. It was these players and others who started the journey to today in Nashville, where the city is celebrated for its passionate, loud and, yes, knowledgeable fan base. Predators fans, by their own admission, did not understand the nuances of the game at the start. Brunette remembers a game when Wayne Gretzky was in town with the New York Rangers and he made one of the artistic plays for which he is famous, banking a puck off the side of the net and to a teammate in the slot for a goal. Brunette said the fans barely reacted, believing it was a lucky play. Things have changed. The fans have embraced not only the Predators but the culture of hockey. They understand the nuances now. In the Western Conference Second Round against the St. Louis Blues, forward Viktor Arvidsson killed more than 10 seconds of a penalty by freezing the puck against the boards and fighting off two Blues players trying to free it. When the puck eventually was turned over, Arvidsson received a standing ovation as he skated back to the defensive zone. Those things, when they are seen by the original Predators, make them smile. It is night and day from the start they experienced. Dunham still returns to Nashville on a regular basis with the Islanders. Plus he has some family in the area. The growth of the city always is among the first things he notices each time he goes there. The same can be said of the Predators as they take part in the Western Conference Final for the first time.